FORT WORTH - Usually, it's high-strung colleagues wired on partisanship surrounding U.S. Rep. Marc Veasey on the House floor. But on Wednesday, it was over-stimulated third-graders wired on ice skating and Christmas swamping the Fort Worth Democrat. “One at a time! Go slowly, and if you need help, hold onto the wall, okay?” he told about two dozen or so children as they poured out onto a local skating rink. The scene was part of the sophomore congressman’s once-a-month ritual, “Marc Means Business.” Every few weeks, Veasey takes on the job of a constituent for a day. After three years, he has an expansive resume: moving baggage on the runway for American Airlines, delivering beer for Ben E. Keith, manning the cash register at both a convenience store and a McDonald’s drive-through window, housekeeping at a Holiday Inn, and making rounds with local fire fighters and sanitation workers. On this morning, Veasey both ran the register and passed out ice skates to local children at Panther Island Ice, a seasonal ice skating rink just a few blocks from his 33rd Congressional district's border. The highlight of the day, however, would come later in the afternoon. 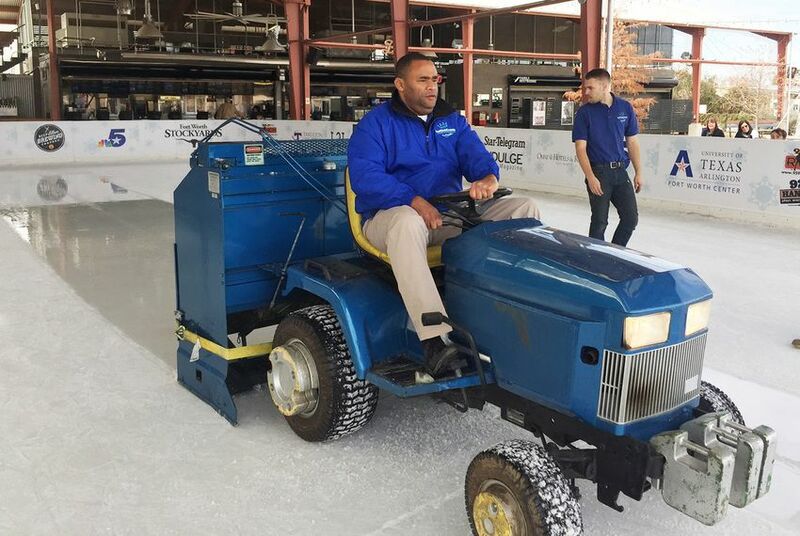 As the children – mostly kids on a field trip from Veasey's alma mater of Walton Elementary School – watched, the congressman drove the ice resurfacing machine – cautiously. Most of the customers were oblivious that the man showing them how to insert a credit card into the chip reader could someday vote to declare war on other countries. His two staffers mostly hung back, taking an occasional photo for social media. Graham built his political reputation on the concept and coined that term: "workdays." Veasey took notice of the concept more than a decade ago, as he came up through the ranks working for then-U.S. Rep. Martin Frost of Arlington. In an interview with the Tribune, Graham said he was flattered Veasey followed his example and that walking in the shoes of regular Americans will make Veasey – or anyone – “a better Congressman." After this summer's Democratic National Convention, the two men found themselves both waiting for planes at the Philadelphia airport, and they discussed workdays over coffee. Graham said in the Tribune interview that he is bewildered that more officeholders do not partake in workdays, given the anger within the American electorate. “I think a good question…to ask at a time when there seems to be a significant number of Americans who think government has forgotten about them, that it doesn’t care what they are thinking [is]: ‘What are you, Mr. Congressman or Mr. Mayor, doing to try and stay in touch so you won’t be that politician who is guilty of losing touch with the people you are supposed to be serving? '” he asked. A few of Veasey's colleagues in Congress also do workdays, saying that it helps them stay grounded amid the jet-set life of a member of Congress: international travel, large staffs, intelligence briefings, fundraising mostly off the moneyed class and racking up stratospheric frequent flyer miles. “It’s a way to find out how people support their families, what they do for a living,” she added. But workdays have an obvious public relations component. Graham said the practice helped him emerge from political obscurity when he ran for governor in 1977. The benefit is even more outsized in the modern era: There is hardly better Instagram gold then a member of Congress in blue or pink-collar attire. Veasey pushed back on that more cynical view, saying workdays help him understand how the regulations before him in the House chamber affects business owners and employees. U.S. senators from Texas and Arkansas engaged in a food fight for the ages at the nation's Capitol earlier this month. It was a blind queso taste test. Inexplicably, Texas lost.